Our science focus this month is plant and animal habitats and their environments. In addition to looking at the parent and offspring relationship and how they meet their needs, we also study what they need to survive. As I’ve said before, my monthly themes are based on our science and social studies standards/units. We use this overall theme to engage student learning and completely immerse the kiddos in the topic. I try to base as much of our reading and writing and math on those central ideas as possible. Each month first grade classrooms are transformed into the unit of study. Studying animals and plants and their habitats is one of my favorites. October’s habitat study started out with a visit to the desert. After discussing the trials that the desert climate offers, we discovered the adaptations that desert plants and animals have that allow them to live quite comfortably in this arid and commonly hot habitat. Then we completed an A LOOK at the Desert activity. The unit comes with a variety of writing activities. This one is designed for early 1st. There is a simpler Kindergarten activity as well as 2 other more developed paragraph writing activities. After the desert we took a trip to the forest. We talked about why animals hibernate while we “visited” the forest. Then we worked on the “Nighty, Night Bear!” lesson and craft. This week we kicked back in the rainforest and discovered all it’s layers. 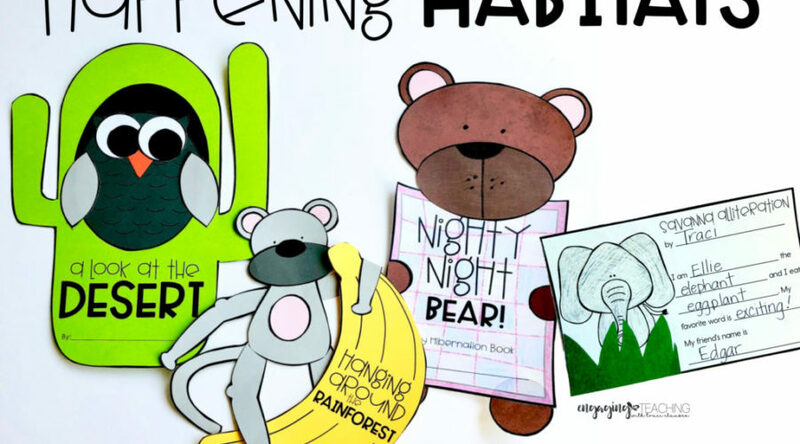 This “Hanging Around the Rainforest” activity was lots of fun for the kiddos. We read the little banana-shaped book and used our inference skills to determine which rainforest animal would fit best with the information provided. It actually comes with 2 different sized monkeys. I LOVE the larger ones, but 30 large monkeys don’t fit too well on the bulletin board. To introduce this unit we look at a lot of books, online videos, Scholastic News, and online images. We also work with these posters. The kids LOVE filling in and coloring their own! Headers to label the different layers of your rainforest bulletin board as well as the board itself are also included. Each of these habitat activities are available individually. They are also available in a bundle. The Happening Habitats Bundle includes a couple extra things for FREE! Sensational Savanna Alliteration is a fun activity that incorporates an alliteration lesson and savanna animals! The bundle also includes some FREE BONUS vocabulary cards. The curriculum police that seem to be all the rage (hopefully this is a quickly dying fad) lately are crawling the rooms again this week. I hope at least one of them leaves my room with a clearer understanding that ENGAGING the students with deep and thorough concepts is important and feeds learning and student buy in! This ridiculous trend of sticking to the district purchased curriculum and nothing else is just “tho tho sad”. I LOVE that the kiddos are always so excited about this unit. I enjoy doing it during the first part of the year because it truly encourages student buy in to the fun we have in engaging in a thematic unit each month! What’s your favorite habitat to teach about? I absolutely love all of your craftivities, especially the sleepy bear!! Added them all to my wishlist for when we cover habitats in the spring! We're having a giveaway if you'd like to stop by! Ha ha…we have the curriculum police too. Some of ours sit in the back of the room and text instead of socializing with the kids or actually paying attiont to the lesson. I find that more annoying than them being there in the first place. I hope it went well!! BTW…You've been Boo-ed. Swing by to find out more. I love all of your animal activities. My daughter is in 4th grade and they just finished up Animal Habitat Diaramas. she loved it! My class went to look at them and they all wanted to do one. I've put your unit in my wishlist. We have a spy that comes to our building. She is hired by the district, but doesn't work for the district (if that makes sense). She never says a word when she comes in. I kind of panic if I feel like we aren't quite on task. My principal said she has never offered any suggestions or critiques, so she has no idea what the lady is thinking.